Review: The fabulous ‘Trocks’ at Nottingham Royal Concert Hall – East Midlands Theatre. It’s not often you can say “This is the funniest evening at the ballet.” With the wickedly funny Les Ballets Trockadero de Monte Carlo (The Trocks) on stage at Nottingham’s Royal Concert Hall you certainly can. 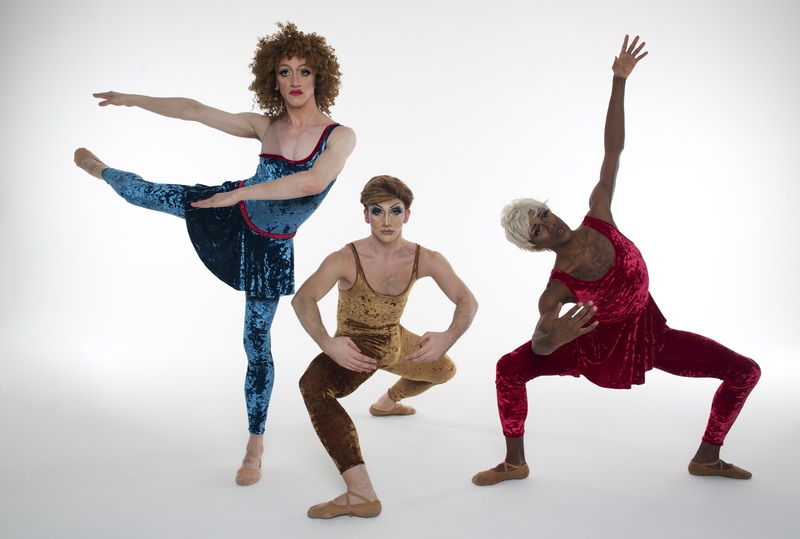 The all male troupe of twenty-six highly skilled ballet dancers have ridiculous fun parodying classical and some modern ballet with their humorously observed repertoire and obvious respect for the genres. The Trocks dance in classical feminine style en pointe and in tutus and ham up the ballet with great affection. The dancers adopt cod-Russian stage names such as the three Legupski brothers, Ida Nevasyneva, Olga Suppozhova and Nadia Doumiafavya. The resultant ballet is a pleasing blend of parody and tribute, grand art, music hall and drag act (with no ‘tucks’) that is frequently played very straight. There is no need to have an awareness of the ballet stories to enjoy this dance show. The delight of this company is that the jokes are obvious even if you’ve never seen the original. False entrances, trips and scene stealing abound as ballet disasters befall the dancers. They carry on regardless with false smiles, disbelief and restrained fury etched on their comical faces. In the mixed programme we see excerpts from Don Quixote set in a Spanish town without the title hero and Sancho Panza as the Trocks claim they would ‘simply get in the way’. Two dubious gyspy ladies cavort around the stage percussing their tambourines, Kitri’s mother dominates. A comical Count springs on to the stage and we are graced with a cast of pretty dancing waitresses. Sometimes it is hard to believe these are men dancing such is their attire, make-up, gracefulness and stamina. An old crone is revealed to be Amour and a terrifically beautiful pas de deux (Kitri and Basil) is executed that brings in elements of competitive humour. Music is by Ludwig Minkus. Even a Merce Cunningham inspired piece, Patterns in Space, gets the Trocks treatment. His abstract style is perfectly parodied with the dancers’ po faced seriousness and attitudes. The two accompanying John Cage avant garde style musicians are hilarious as they make sounds with bubble wrap, paper bags and a bicycle chain and well as effusive gargling. With music by J.S Bach, Go For Barocco, is the more serious of the pieces with three movements, Moderato, Adagio and Allegro and costumed with designs by Mike Gonzoles. Again we have very accomplished dance with a touch of humour. Swan Lake appears twice in this show, firstly in the opening number and later with the dying swan scene. Tchaikovsky’s music is readily familiar as are the magician, Benno and Prince Siegfreid out hunting and the girl swans gliding majestically about with Odette. Except in the Trocks version the magician can’t find his follow spot, swans collide and then regroup in perfect timing picking up the recognisable poses. Benno and the Prince argue. The whole thing is a gloriously funny pastiche and goes down terrifically well as the opening piece complete with pull along cut out swan. In a singularly funny performance Lariska Dumbchenko (Raffaele Morra) performs the dying swan with seemingly endless amounts of white feathers falling from his tutu. His eloquent arms and feathery footwork speak for the artistry and he milks his over the top dying to gales of laughter. As the audience leave the words “fantastic” “stunning” and “brilliant” hang in the air of a very happy foyer at the Nottingham Royal Concert Hall. The Trocks are currently on tour through Dance Consortium and with support from Arts Council England. Oddsocks’ King Arthur takes to the road – very very soon.